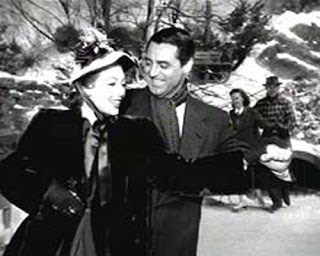 If there is one particular theme I like in movies, it is the theme of Christmas. Movies with such a theme instill a sense of belief and gives a lot of people some hope. A hope to lead life. If it wasn't through life, it was through movies, people found hope and even today, movies is widely considered to be a medium where people find hope. 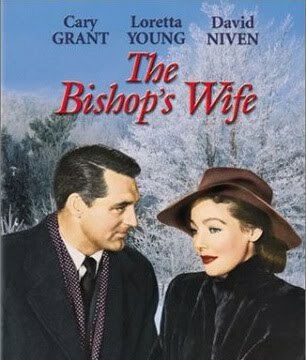 After a long gap, Loretta Young (The Bishop's Wife) is sharing the screen space with Cary Grant (Dudley). To be precise, their last movie together was Born to be bad released in 1934. 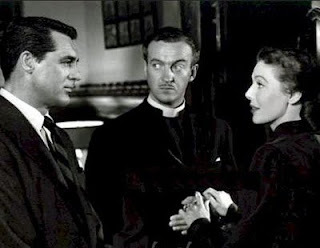 David Niven plays the role of a bishop whose role is mainly limited to ambiguity between the funds for the new cathedral, family and his principles. Why is this movie special? Is it because, it has Cary Grant playing one of the most refreshing roles of his life? 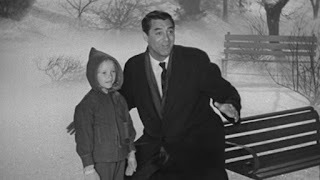 Cary Grant in his role as Dudley plays the character of an angel. An angel who sometimes resembles our inner voice. In this chaotic world, one hardly listens to our inner voice; since its an opinion or a thought restricted to ourselves. But when a feel good thought comes as a suggestion from others, we normally pick it up and on a higher percentage scale apply them. In short, people who are optimistic about lives listen to such suggestions and go about leading their lives catalysed by such thoughts or ideas. Even if it is for a short time, it is the jump start one needs to refresh and get out of cross roads. Professor, The bishop's wife, Mrs Hamilton and few others are the ones who had lost hopes in their respective lives and the same were restored by an angel. Dudley says, "Angel can be anyone on the street. Someone you dont know but can bring in a lot of change in the way we would like to lead our lives." The other side of the coin, cynicism exists as displayed by the Bishop, who refuses to believe in miracles, though being the mortal messenger of the almighty. He was so adamant in building the cathedral, he even went to the extent of compromising his principles to raise the funds. His true prayers (raising funds) were finally answered; though not in a way he wanted. But who would question the method of an angel? He certainly did, but did'nt succeed to over power the methods. Dudley, the angel spends most of his time with Julia, the Bishop's wife and their kid Debby, yet manages to answer the prayers of the Bishop. Strange method indeed. The problem of funds were never looked in, and this movie epitomises the true human nature emphasising the importance to win over someone's heart in order to get what we truely want. Dudley won the heart of Mrs Hamilton, who finally relented to the angel's advice and decided to shed her ego. Donating her money, she helps the Bishop to build his dream, the cathedral, a place which would provide shelter to the needy. Dudley had to leave once the prayers were answered but it was tough as he was attached to bishop's wife, cursed himself for being an angel; as he realised being an immortal it was impossible to beat a mortal to win over a mortal's heart. Directed by Henry Koster, this 1947 movie was nominated in five different categories including Best Picture and it did manage to win one for the Best Sound Recording.